Home News Reports Beyond the hug-and-wink, has the no-confidence motion punctured the Mahagathbandhan balloon? On Friday, in what was probably one of the longest days for the Parliament in recent time, the Lok Sabha debated the ‘No Confidence Motion’ against the government moved by TDP. It was a day of theatrics and gestures and political statements. Somehow amidst all the drama, the demands of the TDP got sidelined. As is usual in all the causes that the Congress joins in, the limelight was shifted to Rahul Gandhi instead. If one looks at the mainstream media for news and discussions regarding the entire affair, it was not about Andhra Pradesh, its demands or the government’s commitment to Andhra’s development at all. For mainstream Indian media, it was all about Rahul Gandhi’s speech, Rahul Gandhi’s strategy, Rahul Gandhi’s maturity (? ), Rahul Gandhi’s hug and Rahul Gandhi’s wink. The opposition lost spectacularly in the no-confidence motion debate. But if one attempts to look beyond the hug and the wink, one significant gaping hole has been brilliantly ignored by most media outlets. Where was the Mahagathbandhan we keep hearing about? After the Congress-JDS alliance formed the government in Karnataka, we have been hearing a lot about the Mahagathbandhan of Congress and all the regional parties that is supposedly the only weapon to bring down the Modi Sarkar. 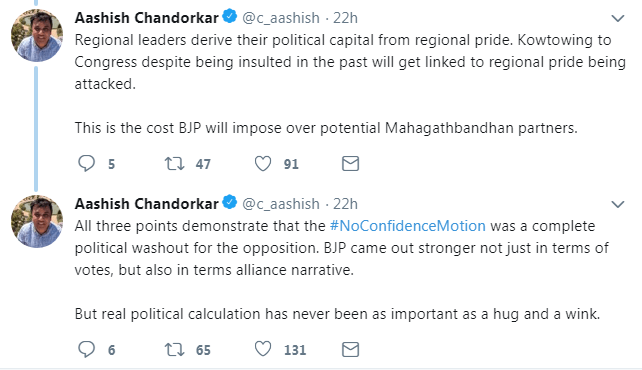 Columnist and Twitter user Ashish Chandorkar has highlighted some very prominent points in a Tweet thread. Of the 145 MPs confirmed to vote for the no-confidence motion, only 126 had actually shown up in the Parliament. This was despite Sonia Gandhi and the Congress, in general, expressing confidence over numbers before the vote. First, Congress inability to stitch a Mahagathbandhan on the floor of the House. The Modi government won the vote 325-126. The gain in votes for the NDA was even greater than expected. The numbers display that a considerable number of Congress and anti-BJP MPs may have, in fact, voted for the government. Most parties had issued whips to their MPs to be present for the vote. Aashish has stated that even considering abstaining MPs, the difference between potential and actual votes is huge. Even assuming that some Congress and its supporting MPs didn’t attend the Lok Sabha session despite the whips issued, the difference between potential and actual votes (145 and 126) is quite large. Quite likely there was cross voting on the floor. Two large parties Shiv Sena abstained from voting and Biju Janata Dal walked out from the debate. Shiv Sena has 18 MPs and BJD has 20. Despite Shiv Sena being an NDA ally, the NDA winning 325 votes without their support is a significant development. Secondly, the @narendramodi govt got 325 votes despite Shiv Sena abstaining. A bunch of AIADMK MPs voted for the govt. TRS, BJD abstained despite being vocal critics. Despite media going gaga over Mahagathbandhan, it was BJP which pulled off a much better alliance strategy. Another important point has been senior Congress leader Kamal Nath vocally criticising the Congress’ move for the No Confidence Motion. Aashish mentioned the PM discussed how the Congress has insulted dissenting voices like Pranab Mukherjee, Sharad Pawar and Deve Gowda. Going by the history, Kamal Nath might soon join the list. There seems to be a rivalry brewing in Madhya Pradesh already between Kamal Nath and Jyotiraditya Scindia with both being projected as potential CM candidates and this may be another crack in making in the grand old party. Ashish further discusses the regional pride playing a deciding role in the fate of the proposed Mahagathbandhan. Regional parties like TMC, DMK, TRS, BJD and many others may not cater to the whims of the Congress royal family. The murky history of Congress leadership ignoring and insulting regional leaders might be used by the BJP in its election campaign to dissuade regional leaders. The Mahagathbandhan already looked doomed with the possibility of powerful stake-holders like Mamata Banerjee and Mayawati not agreeing to accept the Congress being in control of the key leadership. With the 2019 elections approaching fast, the Mahagathbandhan or the ‘United Opposition‘ balloon being floated by Congress looks duly and properly punctured after the Parliament voting results. However the Congress may try to project Rahul Gandhi as the hero, it is evident that he is not able to hold much sway in regional politics. No amount of hugs and winks will change the fact.